Since I am a sucker for designer lawn, my lawn mania continued in the past few weeks because some of my favorite brands have been offering huge discounts. 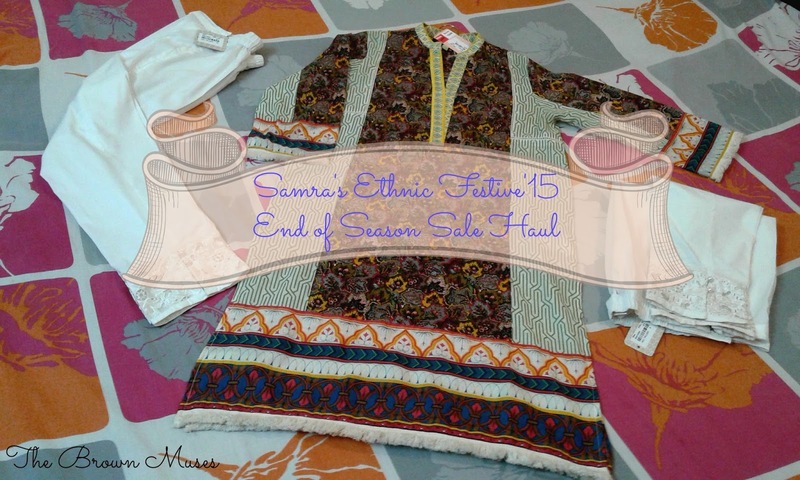 Ethnic by Outfitters nailed it with up to 50% off Festive’15 Sale. There’s no denying the fact that Ethnic has been my one of my favorite brands this Summer on account of their huge variety of lawn, cotton net, floral as well as digital embroided lawn etc. You can see my previous Ethnic haul from the Independence Day Sale here. The twinning trend has taken me and my friends by storm as we share our love for clothes, jewellery, shoes and bags, so we often fall for the same things and buy them all at once! 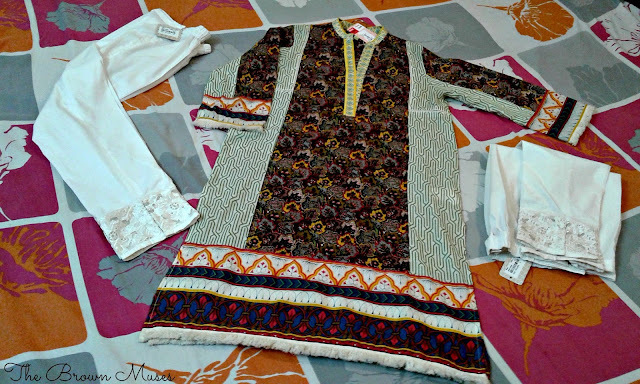 This time, we got this Kurta from their Basic line on a whim. It is a floral green colored Kurta with yellow edging. I absolutely loved the thread details at the edges of sleeves and daaman. 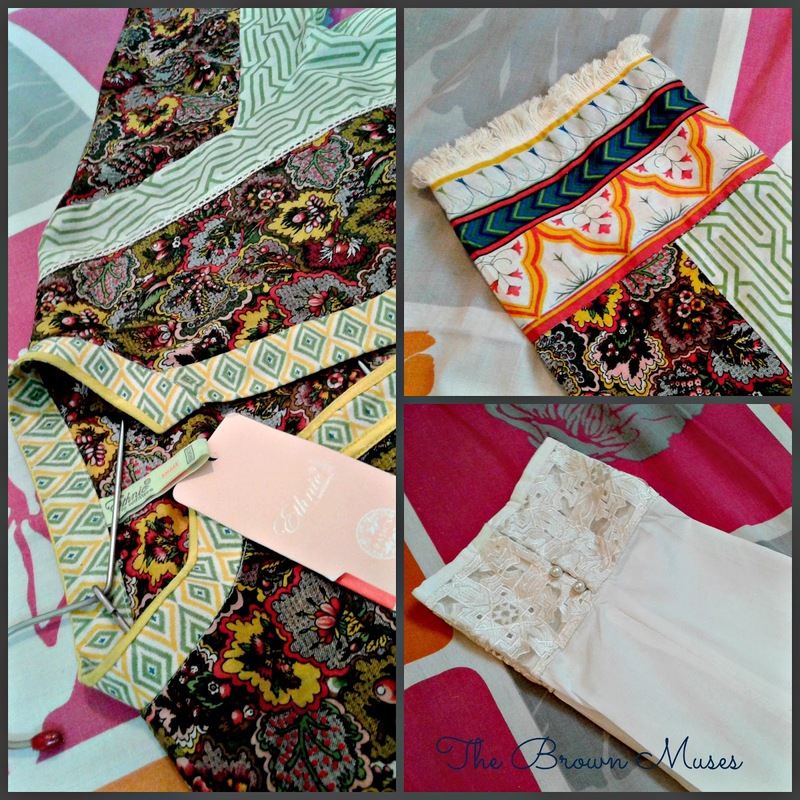 Buying all the different kinds of bottoms is my newly found love and Ethnic has come up with a huge variety of bottoms this year ranging from from basic trousers and tights to the embroided ones and those with metallic and other kinds of buttons. I absolutely love the Ethnic tights with mini gold button detail which I purchased before. You can have a look at those here. This time I stumbled upon these trousers and instantly fell for them, reason being the embroided organza based lace with pearl buttons. The cut and design is simply perfect! I tried these on and without having any second thoughts, I got’em for my sister-in-law and myself. Price & Availability: I got these trousers for PKR 950 each after discount. Whereas, this Kurta from their Basic line cost me PKR 1240 after 50% discount against the original price of PKR 2490. Stay connected for more haul posts as our Farewell to Summer’15 End of Season Sale Haul Series continues..
Disclosure: These products are my own purchase and the views and opinions expressed hereby are strictly unbiased, based on my personal experience.